With a great riff played on the sitar Paint it Black by the Rolling Stones is a rock classic and our Flashback Friday for this week. Flashback Friday – Paint it Black by the Rolling Stones. Let’s face it when it comes to the Rolling Stones there could have been any number of their songs which we could have selected for our Flashback Friday. From Jumping Jack Flash to Brown Sugar, Gimme Shelter to Honky Tonk woman the hits go on and on. What is more there aren’t that many Rolling Stones songs that most of guitarists haven’t tried to play. After all the Rolling Stones really do know how to write a catchy riff. But for me Paint it Black is an absolute classic tune and one of the first things I tried to learn when I first picked up the guitar. First released on the 6th May 1966 the song was written by Jagger and Richards and went to number 1 in both the US and the UK. The other notable fact about Paint it Black is that it was the first number one to feature a sitar, a proper pub quiz question if ever there was one! Although Jagger and Richards wrote Paint it Black it was guitarist Brian Jones that developed and played the catchy sitar riff that has made the song so memorable. Having become bored with conventional guitar melodies Jones started to become interested in exploring the potential of Eastern instruments. In particular he was fascinated by the potential of the sitar. Thankfully for us being a multi-instrumentalist it didn’t take Jones long to arrange the basic melody for the song and turn what could have been an ordinary song into a rock classic. Paint it Black has been used in countless scores for Films, TV series and computer games. The tone of the song, bleak and dark, resonated with the era in which it was released – Vietnam and the height of the Cold War. It is therefore understandable that films such as Full Metal Jacket and the TV series Tour of Duty would use Paint it Black as a theme. 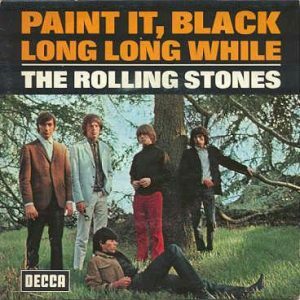 There it is our Flashback Friday for this week is Paint it Black by the Rolling Stones. Rockburn Strat Guitar – good or bad?